Save Ian Holloway’s BBC column! 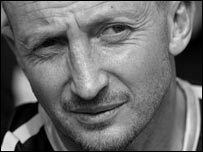 The BBC is asking readers of its website if they would like to see Ian Holloway keep his column for next season. What a stupid question – of course he should keep his column, it’s 20 times better than the mundane cliches churned out by other football columnists, such as Kevin Nolan and Owen Hargreaves. I can’t even believe they have to ask. Want Â£1000 CASH to spend on your car? Enter this cool competition at http://www.clubland.fm/index.php/news/show/title/fast-car-and-clubland-want-your-ride.html and your pride and joy will star in the artwork for Clubland 11 and a full feature in Fast Car Mag.